Congress and JDS activists who tried to storm the Income Tax office were arrested and later released as the protest on the ever busy Queens Road resulted in chock-a-block with hundreds of vehicles stuck in the traffic jam. 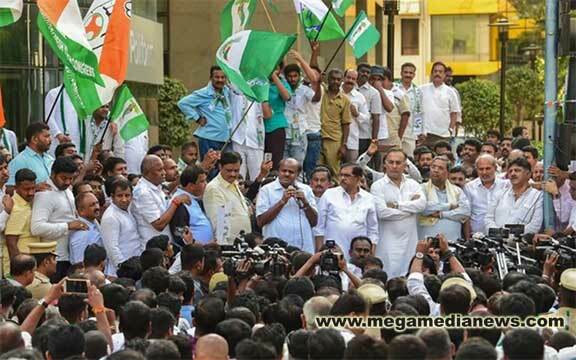 The ruling alliance was particularly angry as they alleged that the IT raids were carried out on JD(S) leaders overseeing the elections of Kumaraswamy’s son Nikhil Kumaraswamy in Mandya and nephew Prajwal Revanna in Hassan. Taking on the Modi government in the first such protest by the State chief minister against a central department in recent memory, Kumaraswamy lashed out at it for “misusing” the IT department and other central agencies. “We are not opposed to raids. We are opposing it because it is restricted to a few political parties in the opposition. They want to threaten them,” a visibly angry Kumaraswamy said. The crackdown came within a day after he claimed last night that the IT raids had been planned from 5 am on Thursday and he would not be deterred and would protest against it like his West Bengal counterpart Mamata Banerjee. In an unprecedented showdown with the Modi government, Banerjee had sat on a dharna after the CBI tried to quiz Kolkata Police Commissioner Rajeev Kumar in connection with Saradha and Rose Valley Chit Fund scams. “They are out to frighten us but the fact is the BJP is shaken and wants to win election by intimidating us. We are not the ones who get scared,” the chief minister said. Strongly defending its action, the IT department said its activities should not be politicised, personalised or trivialised. “We request that the activities of the income tax department should not be politicised, personalised or trivialised. In particular, statements which sound like an incitement to physical violence issued by persons holding very responsible posts are deeply deplorable,” it added. The searches were carried out on a wide range of professions and businesses including bureaucrats, breweries, MNCs, mining barons, diagnostic centres, trusts, educational institutions, medical colleges, real estate, fisheries, and film industry and including “politically exposed persons,” it said. The department also said in a release that no MP, MLA or minister had been covered in the searches and they were being carried out on the basis of credible information. “A BJP leader sends list of people to Amit Shah, who eventually forwards it to Balakrishnan (principal chief commissioner of income tax department (Karnataka-Goa region) to carry out raids. Balakrishnan is acting as an agent of BJP. It seems that he wants a post retirement position such as governor of some state,” Kumaraswamy said. Kumaraswamy questioned BJP state chief B S Yeddyurappa as to whether he could win elections without money. He also said for the first time the I-T officials raided government offices too, such as PWD office in Hassan and Tahsildar office in Kanakapura. The coalition partners said the raids were on people, who were monitoring the electioneering of Nikhil Kumaraswamy and Prajwal Revanna from the Gowda clan, targeting state minor irrigation minister C S Puttaraju and his nephew Ashok, who is a district panchayat member in Mysuru. The raids were also carried out at the residences of PWD minister H D Revanna’s close associates Narayana Reddy, Ashwath Gowda and Raya Gowda in Hassan, IT sources said. Revanna’s son and former Prime Minister H D Deve Gowda’s grandson Prajjwal is contesting from Hassan Lok Sabha seat. Nikhil Kumaraswamy and Prajwal Revanna are testing political waters for the first time under the tutelage of Kumaraswamy and PWD minister H D Revanna. Former chief minister and Congress Legislature Party leader Siddaramaiah questioned the timing of raids andsaid they could have been done a month before the election. “But when the election dates were announced such action raises many eyebrows,” he said. Yeddyurappa rubbished the charges, saying the Income Tax department was doing its duty and it should not be linked with politics. According to the I-T department, the searches have resulted in collecting credible evidence on tax evasion. The searches on “politically exposed persons” have covered their entire range of the political spectrum, it said. The I-T department also said CRPF personnel being used for the searches had not been flown from outside the state and they were requisitioned from the state police following the normal protocol.